Activist Rehana Fathima, who had attempted to enter the Ayyappa temple in Sabarimala when it opened for monthly puja last month, was arrested Tuesday for allegedly hurting religious sentiments through her Facebook posts, police said. Fathima, 32, was arrested from office in Palarivattom in Kochi, a police officer said. The activist, a BSNL employee, was booked by police in Pathanamthitta on a complaint by Radhakrishna Menon, alleging that some of her Facebook posts hurt religious sentiments. She was booked under Section 295A of the Indian Penal Code deliberate and malicious acts intended to outrage religious feelings of any class by insulting its religion or religious beliefs. She was later taken to Pathanamathitta after her arrest, police said. A controversy had erupted in Kerala after Fathima made an attempt to enter the Sabarimala temple when it was opened for monthly puja in October following the Supreme Court order allowing entry of women in the age group of 1050. Anticipating arrest, she had moved the high court seeking anticipatory bail, but it was rejected. Dismissing the plea, the court had directed that police can take appropriate steps in the case. 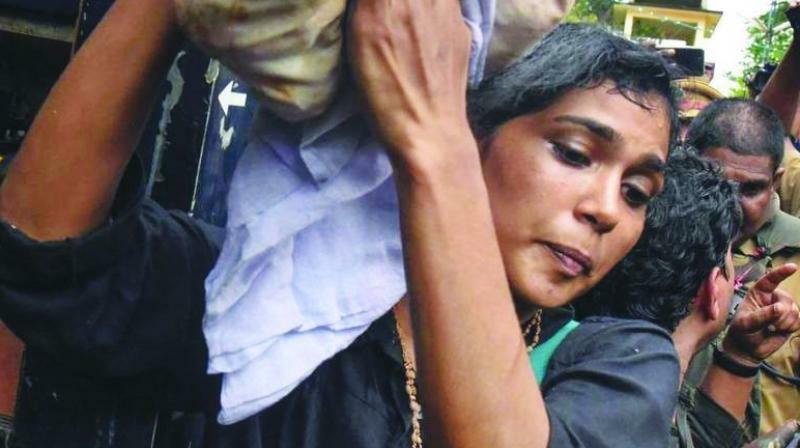 Fathima, who was also part of Kiss of Love movement in Kochi in 2014 against alleged moral policing, was among the two women who had reached the hilltop on October 19 but had to return before reaching the sanctum sanctorum due to massive protests by Ayyappa devotees. Fathima and Hyderabadbased journalist Kavitha were taken to the hills with heavy police protection. Some young women who tried to enter the temple were targeted by devotees when the temple was opened for six days on October 17 for the first time after the apex court order. On September 28, the Supreme court had lifted the centuries-old ban on the entry of women of menstrual age into the shrine, but a section of devotees are protesting the decision.